Excitement spread through the district the first week of June when approximately 3,120 graduates moved their tassels to the left signifying the end of their high school journey and the beginning of their growing independence. Graduates from Tegeler Career Center, Dobie, South Houston, Pasadena, Pasadena Memorial and Sam Rayburn High Schools proudly marched down the aisles of Pasadena Memorial High School and NRG Stadium to the sounds of Pomp and Circumstance and a roaring crowd of over 27,380 family members, friends, staff, faculty and administrators. Each high school graduation welcomed distinguished guests including Board of Trustees, school administrators, counselors and community leaders. Exemplary students from each high school delivered riveting speeches full of genuine passion and concern for graduates ready for the next step in their journey. Here is an overview of all the commencement ceremonies that took place during graduation season in Pasadena ISD. One by one, 54 Tegeler seniors crossed the stage to receive their diplomas at commencement at Pasadena Memorial High School, Tuesday, June 2. There was not an empty seat in the auditorium. When each name was called, it was punctuated with cheer and applause from the crowd. The graduation speeches, delivered by seniors Eric Alba and Karla Valdez, complimented each other. One encouraged students to remember where they came from, while the other empowered students to let those experiences be a guide for the future. “Always remember who you are, where you’re from and what you represent,” Valdez said. Principal Jean Cain was filled with emotion as she presented a challenge for the new graduates. The night concluded with a video presentation and a reception in the cafeteria. The non-traditional high school provides students an opportunity to learn a trade while earning their high school diploma. 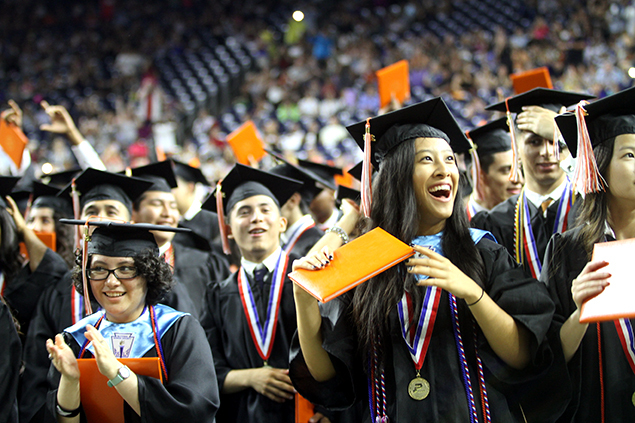 A sea of black robes filled the center of NRG stadium during the Dobie High School commencement ceremony Wednesday, June 3. The school graduated the highest number of seniors in the district with 825 students. The event welcomed over 9,000 attendees. The night began with the presentation of the colors by the school’s Air Force Navy JROTC, followed by the national anthem performed by the senior choir and then the invocation by senior Tia Joseph. Principal Franklin Moses introduced the night’s speaker. A member of DECA, the National Honor Society and captain of the debate team, Dobie senior Juan Reyes, Jr. had the honor of addressing the senior Class of 2015. Decorated in academic medals of achievement and ribbons of all colors, Reyes reflected on his experience at Dobie and encouraged students to rise up and show the world what they can accomplish. “It was August 22, 2011 to be exact,” he said to the crowd. “The first time we stepped into J. Frank Dobie High School, we were the only ones in the building that Monday. The school seemed to be so huge, shiny and new. We were confused about what classes we had, where to go, and how to deal with the upper classmen. You might say J.F.D was going up on a Tuesday. But we did not need to be nervous though because we were fine. All the time we spent with standardized tests, finals and our extracurricular activities was worth it because we are here,” he said with enthusiasm. The seniors matched his level of enthusiasm with applause and cheer. Shortly after his address, students stepped onto the stage in front of the crowd to claim their diplomas – a tangible symbol of their academic success and hope for a positive future. The South Houston High School Navy JROTC greeted students with the arch of swords as 555 seniors poured into NRG Stadium for the graduation, Thursday, June 4 for the final day of commencements. Perhaps one of the most touching moments of the day could not be seen by the crowd of 3,379 attendees. As graduates waited in line for the commencement to begin, the eager students cheered and high fived Special Ed. students as they walked past a long line of graduates and down the hallway to their post. The senior choir kicked off the event with the National Anthem, followed by the invocation by Estivaliz Garza. School Principal Dr. Steven Fullen congratulated the group of seniors on being the 58th graduating class to receive diplomas from South Houston. Fullen introduced the platform guests including alumni Emory Gadd, associate pastor at Sagemont Church in Pasadena, counselors, the board and the commencement speaker senior Mujidat Folawiyo. Folawiyo delivered an empowering speech about not taking freedom for granted. One could see the soon-to-be graduates and parents overcome with joy as students shook hands with campus administrators and sometimes exchanged hugs as they received their diplomas. The ceremony ended with the benediction by senior class president Karen Perez. “Thank you for the four year journey and the lifelong friendships and memories we made along the way,” Perez said. Over 470 students of Pasadena High School’s graduating Class of 2015 filed into NRG stadium wearing green robes, while about 22 others dawned black robes. The students in black made history this year as the first graduating class of the Pasadena Early College High School, graduating this semester with both their Pasadena High School diplomas and San Jacinto College associate degrees. One could feel the excitement when these students were asked to rise to their feet to be recognized. The stadium full of 3,600 audience members and administrators erupted with cheer. Principal Joe Saavedra recognized and presented a plaque to this year’s valedictorian, Cynthia Moreno. The graduate attended Morales Elementary, De Zavala Middle and Jackson Intermediate. She participated in several academic organizations including National Honor Society, Mu Alpha Theta and Decathlon and was a violinist for four years. She plans to attend UT to major in chemistry and pursue a career in pediatric oncology. School Superintendent Dr. Kirk Lewis introduced the commencement speaker David Escalera. He moved from Mexico before enrolling at PHS. He was a member of the National Honor Society, National Hispanic Honor Society, a member of the academic decathlon, he participated in several theater productions. He plans on attending Texas A&M University. He shared one of the most important lessons he learned in his four years at PHS. Saavedra delivered an emotional and personal story to inspire students. He explained that he keeps four meaningful items in his pockets as a subtle reminder of his purpose in life. The first is a rock he received 11 years ago from a teacher who encouraged him to make room for the most valuable rocks in one’s life. The next three items he showcased were small seashells he received from his children, which he has held on to for years. This year, PHS seniors garnered over $1,294,740 in scholarship awards. Over 6,567 family, friends and community members gathered for the Pasadena Memorial High School commencement ceremony that evening to witness 640 seniors receive their diplomas. Valedictorian, member of the National Honor Society, National Hispanic Honor Society and Interact Club Officer, Stephanie Green delivered the commencement speech for PMHS. She is also a National Merit commended scholar, Texas music scholar and has received academic excellence awards all four years of her high school career. She is also an Advanced Placement scholar with distinction. She will attend Rice University in the fall to study biology. Green prepared students for adulthood. Principal Angela Stallings was overcome with joy as she looked out at the crowd of students. Board of Trustees each took turns shaking hands with students after they received their diplomas. Board President Mariselle Quijano stepped forward to share a warm embrace with her daughter who graduated that evening. After the last name was called, students tossed up their caps and held up their hands as Anthony DeLeon, senior choir officer, sang the school song. Students later joined their family and friends and celebrated their accomplishment. The Sam Rayburn Class of 2015 was the final group to graduate Thursday, June 4, where 575 students moved their tassels to the left and tossed up their hats to celebrate their victory. Over 4,770 attendees filled the stadium for the celebration. The event was led by students. The night began with the presentation of colors and the National Anthem performed by members of the senior choir, followed by the invocation by Flor Avalos, senior class vice president. “Help us stay true to our dreams, to use our gifts wisely and to walk into the future with faith, hope and great love,” she said. Alicia Olivo, senior, introduced the distinguished platform guests, Dillon Nassour introduced homeroom teachers, Misael Garcia introduced the student speaker, Amanda Ramirez, senior. Ramirez is an AP scholar and has been involved in the President’s Award program. She is also a UIL scholar and Jones Scholarship recipient. She is also a member of the National Honor’s Society and the National Social Studies Society. She plans to attend Emory University to major in biology and minor in music. Ramirez motivated her peers to be brave in their journey. Principal Robert Stock asked for seniors to remember the values taught to students throughout their high school careers at SRHS. Jocelyn Huitron, senior, explained the meaning behind the moving of the tassel.